The good news is that with a little time and attention, a backpack full of non-toxic school supplies is in reach. Purchase your back-to-school supplies (and any other item, for that matter) through EWG's link to Amazon. Amazon will donate part of your purchase to EWG! Or download the PDF to take with you to the store. Art supplies. Many contain toxic chemicals that are not suitable for children -- especially younger ones. Pay special attention to these: Paints should be water-based to avoid solvents and colored with natural, non-metal pigments. Don't buy polymer clays that stay soft at room temperature or can be hardened in a home oven -- they're made from PVC (polyvinyl chloride) and often contain phthalates. Consider making your own "clay" out of common baking ingredients instead. Note: A label that says "Conforms to ASTM D-4236" simply means the product is labeled as required, not necessarily safe. Hand washing. Choose sanitizers with ethanol (ethyl alcohol) but no fragrance, and liquid hand soaps without triclosan, triclocarban or fragrance. And remember: Plain soap and water is often just as effective! Learn more. Backpacks. If it's time for a new one, look for natural fibers and skip those made with PVC. If natural fibers aren't an option, polyester and nylon are better than PVC. (Check the label for #3, the symbol for PVC, or look for "no PVC" on the label.) Labels don't always list the material, so you may need to contact manufacturers or visit their websites. Lunch boxes. Because they hold food, it's especially important that lunch boxes be made from non-toxic materials with NO lead paint, PVC, BPA and antimicrobial chemicals. Some options are: cotton lunch bags, BPA-free plastic or unpainted stainless steel. Reuse utensils from home and pack food in reusable, rather than disposable, containers (such as lightweight stainless steel or #1, 2, 4 or 5 plastics). Find a safer lunch box on Amazon. Beverage bottles. Skip commercial bottled water -- it's expensive, wastes resources and the water quality isn't necessarily better than tap. Instead, send your child to school with filtered water and other beverages in a reusable bottle made from BPA-free plastic, BPA-free aluminum or stainless steel, such as Klean Kanteen. Click here to order yours on Amazon. Learn more about the downside of bottled water here. Markers. Common crayons often contain paraffin wax, which is made from crude oil. Look for alternatives like soy and beeswax. Don't buy dry-erase and permanent markers, which contain solvents. Be wary of plastic-encased crayons or scented markers -- scents encourage kids to sniff them, and the chemicals used in the fragrances are not listed on the label. Try a pencil highlighter instead of the familiar plastic ones. Pencils and pens. Pick plain wooden pencils (no paint or glossy coating) made from sustainable wood or recycled newspaper. Skip the scented ones. Try to use recycled ballpoint pens. Find recycled pencils on Amazon. Notebooks and binders. Avoid plastic covers on binders and spiral notebooks; they're usually made from PVC (#3 plastic). Opt for recycled cardboard or natural fibers instead, or look for "no PVC" on the label. Paper products. Look for recycled paper,available here, made from at least 30 percent post-consumer waste (PCW) that isn't whitened with chlorine bleach. Or consider virgin paper made from alternative fibers or sustainably managed forests. Choose 100 percent recycled tissues and paper towels made with PCW and without chlorine bleach. Avoid added lotion, fragrance and dyes. Glue. Try to minimize kids' exposures to extra-strong or instant adhesives like epoxies, model and "super" glues; they contain toxic solvents. Water-based glues are safer bets, though most are made from petrochemicals. Some better options are: glue sticks, white/yellow/clear "school" glue. 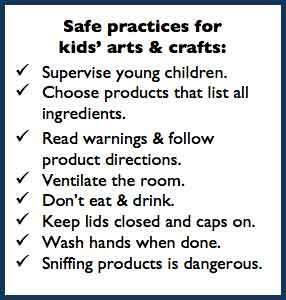 Stock up today.Children should not use rubber cement. Cell phones. A lot of kids have cell phones. If purchasing a new phone, choose one with lower radiation ("SAR" value) by searching EWG's cell phone database. Teach your child that when she's not using it, she should turn it off, store it in her backpack or somewhere else away from the body, and text instead of talking. Get our eight cell phone safety tips here.